The IRS expects to receive about 153 million 2018 individual income tax returns this year — 18.3 million in the final week of tax season. In all, the agency paid $220.7 billion in refunds as of April 5. That’s down by $6 billion from a year ago. The average refund check is $2,833, down by about $30 from last year. Tax season has come and gone — at least for the more than 103 million filers who submitted their returns before April 15. This spring marked the first time taxpayers and their accountants submitted tax returns under the Tax Cuts and Jobs Act. The overhaul of the tax code, which went into effect in 2018, increased the standard deduction to $12,000 for singles ($24,000 for married couples filing jointly), eliminated personal exemptions and curbed a number of itemized deductions. The Treasury Department and the IRS also updated the withholding tables last year to reflect the new laws. These tables, when used with Form W-4, help employers deduct income taxes from your pay. 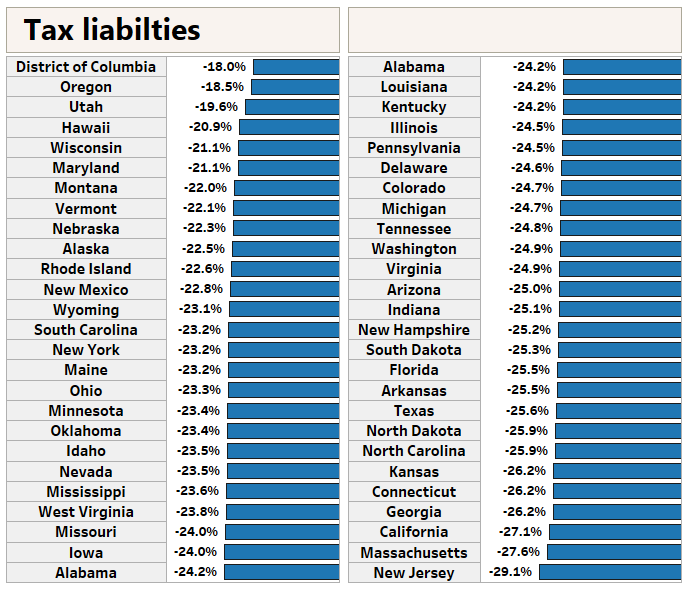 Overall, individual income tax rates also went down. Amid all of these changes, taxpayers have one burning question: "How did I fare under the new tax law?" Many are looking to their refunds as an indicator of how they did, but those checks only tell part of the story. The IRS paid $220.7 billion in total refunds as of April 5, down by about $6 billion from a year ago, according to the agency. The average refund check is $2,833, down by about $30 from last year. "People are looking at the bottom line, which for them is the consequence of filing the return then and there: Did you get a refund or do you have a balance due?" said Nathan Rigney, lead tax research analyst at the Tax Institute at H&R Block. Got your 2018 tax return? Dig up your 2017 return, too. Focus on line 15 on your 2018 return and line 63 on your 2017 return, Rigney said. These tell you your total tax paid in those respective years. Compare the two. "The first thing to figure out is did you have a tax liability problem? Or did you have a withholding problem? Was it losing the ability to itemize?" asked Jeffrey Porter, CPA and founder of Porter & Associates in Huntington, West Virginia. A decrease in liability alone isn't necessarily a guarantee you won't owe the IRS in the spring. For instance, if your tax liability went down in 2018, yet you also significantly didn't withhold enough that year, you may end up owing. In this case, your taxes went down and money you would have otherwise paid the IRS went into your paycheck — enough that you underpaid Uncle Sam last year and now owe. 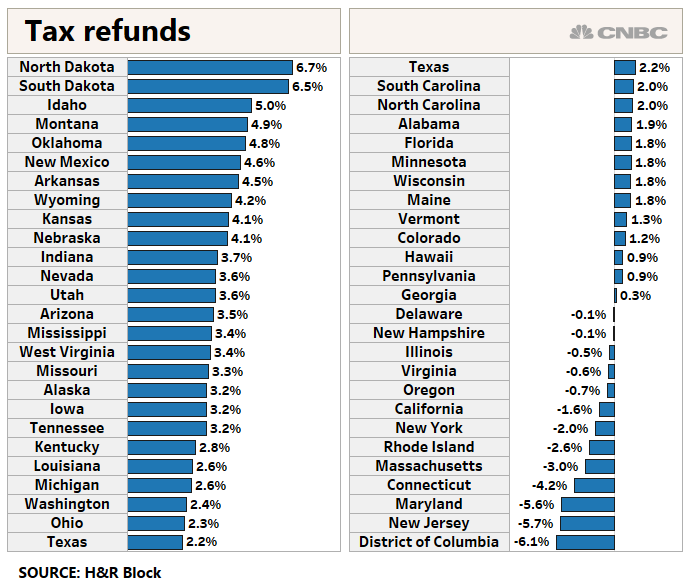 The chart below shows how the average tax liability changed in your state, according to H&R Block, based on tax returns filed through March 31. Taxpayers in New Jersey, home to some of the highest property taxes in the nation, experienced a 29 percent decrease in tax liability year over year, but that benefit wasn't shared equally among all households, according to H&R Block. For instance, filers in the state who didn't pay the alternative minimum tax last year but who paid high state and local taxes — and who didn't have children — might be more likely to pay more taxes year over year, said Rigney. That's because the state and local income tax deduction has been limited to $10,000, meaning people with high property and income tax bills can't write off as much of the liability on their federal returns. On the other hand, households with children under age 17 probably fared better, Rigney said. They benefited from the $2,000-per-kid child tax credit, which is doubled from 2017. This credit now starts to phase out at $200,000 of adjusted gross income for single filers ($400,000 for joint). Prior to the tax overhaul, the child tax credit started to phase out at $75,000 for single filers ($110,000 for joint filers). If you fail to act after completing your 2018 taxes, you can expect a repeat next year. Consider these four steps to do better next time. Prepare in advance: Consult your CPA now and draw up a plan to make 2019 less painful. "If the outcome wasn't better, can we do things differently?" asked Porter. "Clients are more interested in hearing that now." Look at your withholding: If you failed to withhold enough tax in 2018, you're set to be in the same position for 2019 unless you do something about it. Whether you're a former itemizer, a W-2 employee with side-gig income or a household with dependents, it's worth reviewing your tax withholding. This also applies to retirees who get their income from many sources: Use Form W-4V to withhold from your Social Security check and Form W-4P to withhold from your pension. Examine tax-friendly opportunities at work: Saving in your 401(k) and contributing to your health savings account give you two benefits: lower taxable income and a shot at retirement security. Here's another tax play at work: A dependent care flexible spending account allows you to put away up to $5,000 on a pretax basis to pay for care if you have kids under age 13. Plan your charitable giving: If the higher standard deduction kept you from itemizing this year, talk to your CPA about bunching your charitable contributions so you can hit the hurdle next year. "Bunching" allows you to cram in two or more years' of charitable giving into one year. This way, you itemize deductions every other year.